It’s ‘Back to School’ for our 18-inch Miss and time for uniforms, book bags and bus rides. This adorable School Uniform was made using both Quilter’s and Lightweight Cotton. Being totally reversible, this relatively easy PDF pattern offers four alternative outfits – perfect for the girl-on-the-go. Mix checks and plaids with solids for a delightful uniform, or patterns and plains for a cute skirt and blouse. Or, make a school uniform on one side and an after-school outfit on the other – the options and color combinations are endless. 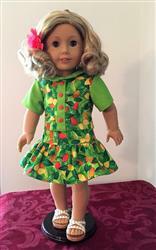 This pattern is designed to fit 18” soft-bodied dolls such as American Girl®. Fabric Requirements – Quilter’s Cotton and Lightweight Cotton was used for the skirt, blouse and contrasts. Heavier weight fabric is not suitable and may distort the reversibility of the blouse. -Matching Thread, Marking Pen, Point Turner, 2 Safety Pins, general sewing supplies; Universal Sewing Needles – 80/10’, Walking Foot, General Purpose Foot and a ¼” Foot. This pattern is nicely designed and fits perfectly.